I sometimes wonder what people think about me strolling around the neighborhood and peering into people’s yards—looking for cats, of course. Recently, while chatting with the cashier at Healthy Heights Pets Market, other customers came in and I decided best to excuse myself and let her serve them. We had a good conversation about journalism and writing; she offered her name, as did I. One of the other shoppers said, referring to me: “The photographer”. Yikes! Recognized and categorized. 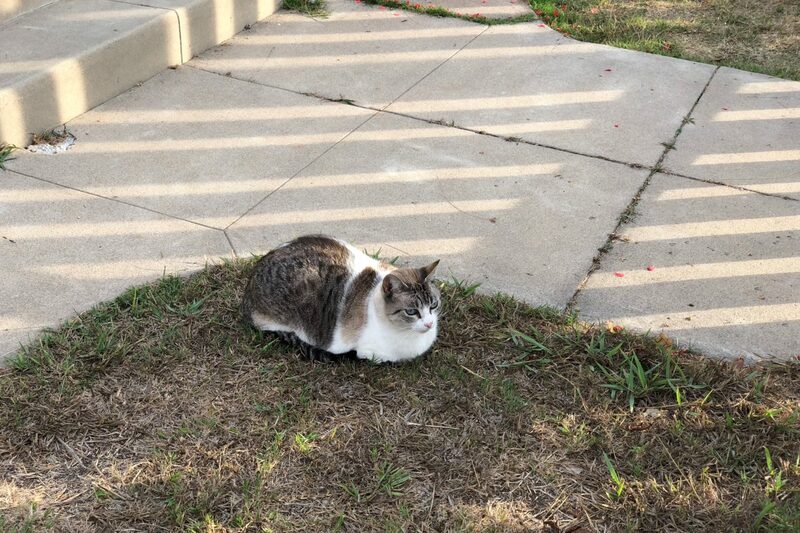 Yesterday afternoon, while walking along Mississippi Street towards Mission, I spied a pretty kitty sitting on grass behind a white picket fence. I pulled out iPhone X and snapped a shot from standing, approaching position—in case he scattered, which will happen depending on the furball’s temperament. I crouched down to shoot through the fence. Then a SUV horn bellowed behind me. I had stepped backward into the driveway, just as someone else wanted to pull in. Apologizing, I scooted out of the way and continued capturing portraits. Deliberate decision was made to hang around: Perhaps the person could tell me the animal’s name. A man got out of the vehicle, opened the side door, and pulled out one of those giant H2O-filled containers for water coolers. As he moved by to the wooden gate, I asked the wrong question: “Is that your cat?” His response was swift: “No”. I shot a couple more pics of the animal as he unlocked the door and made his delivery. As he came out, the shorthair—which for obvious reasons I nickname Aqua—whisked inside. Clearly the feline had been waiting for somebody to come home. By all evidence the man lives there. But that doesn’t mean Aqua does. The oldster Monkey roams a portion of Alabama Street, where he can be seen meowing in front of several different doors before being let in. Aqua might be insinuating herself; or not. As I walked away, yesterday, the gentleman returned to the SUV but also clearly watched me move into the distance. Then he returned to the house. In retrospect, I should have asked the cat’s name, which was the infromation I wanted. He might have answered. The encounter left me feeling a little uneasy—as did an earlier attempt to engage Itchy Valentino‘s owner while he watered the lawn. His manner, while polite, like the other gent’s, communicated: “I’m busy”. I am not the paranoid type, but being so visible along the same streets—as an avid walker and amateur cat photographer—surely people recognize me. That’s likely more so when carting along a mirrorless digital camera, which these days is Leica Q.
I don’t mind if some folks typecast me as a cat crazy middle-aged oddball. I’m not furball obsessed. This series is an opportunity to improve my photographic skills, to become more familiar with the neighborhood, and to interact with more of its residents. People love their pets, and photos can mean something to the owners. While dog walkers are everywhere, cats are the Internet meme. How could I choose any other beast? Hopefully good reputation, if any, precedes me. Like “the photographer”. If not, this series—started in October 2016—has gone on for 12 months longer than I had expected. There will be an end, because—reemphasizing—I am not a cat crazy. But there is still purpose to the project not yet fulfilled. Perhaps this post is a metaphor for something else. None of us is as invisible as we feel. This is nowhere truer than social networks like Facebook, where people post relentlessly; lives become showcases, even as sharers act like they are shrouded and protected, when they are very much exposed. On the flip side, some people feel more important than they are, which taps into the whole narcissistic character of social networks. But that’s topic for another day. 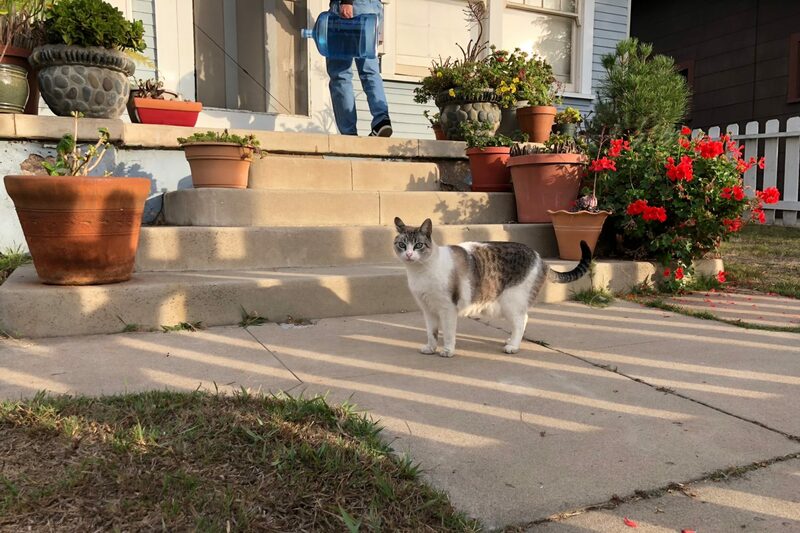 Now, regarding the cat captures, the Featured Image shows Aqua at attention after the gent carried the water inside, closing the screen door behind him. Then, almost on cue, the cat rushed up the steps and squeezed through as the fellow creaked open the door to come outside. Vitals: f/2.4, ISO 16, 1/269 sec, 6mm; 3:27 p.m. PST. The second, an auto-HDR render: f/1.8, ISO 20, 1/527 sec, 4mm. The last, taken the previous minute: f/2.4, ISO 16, 1/156 sec, 6mm. All three photos were recropped 3:2 but otherwise are untouched. 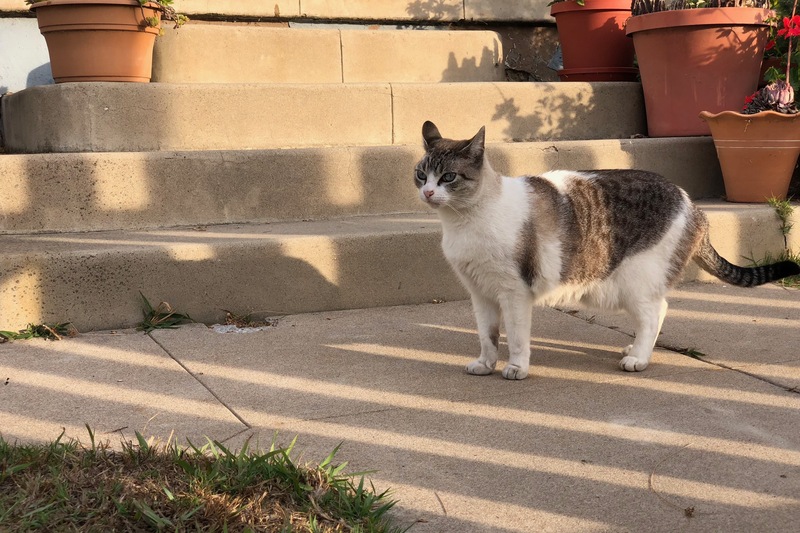 Update, Jan. 17, 2018: I walked by the house where I had previously seen the kitty (twice), as a woman stepped out the front door into the yard. I stopped, and describing the cat, asked if it was hers. No. Pointing, he lives across the street. His real name is Frankie. “He’s a neighborhood cat”, she said. “He goes wherever there is food—whoever feeds him”. As if on cue, as she moved up the steps to the door, Frankie squeezed through the fence meowing. Don’t miss: Scruffy, Roly Poly, Woo, Skull, Biscuit, The Colonel, White, Chipper, Frisky, Stretch, Needy, Farfisa, Mates, Hunter, Pee-Pee, Blue, Blue Too, Bonded Pair, Patience, Fess, Jumper, Frenemy, Looker, Cozy, Scout, Lurks, Skit, Mini, Betty, Black and White, Stalker, Bell, Chill, Sammy, Scratch, Poser, Star, Grey and White, Watcher, Herman, Comet, Roman, Willow, Chub, Nimbus, Watson, Lilo, Kit, Pepe, Twilight, Sebastian, Spot, Booger, Ash, Veruca, Riley, Mellow, Bonde, Flower, Glass, Black, BeBe, Fang, Bruce, Siamese, Pounce, Tortie, Haiku, Fraidy, Peso, Daniel Tiger, Dusk, Stride, Dainty, Spry, Tabby, Betty Too, Still, Levi, Shadow, Sophie, Wink, Ferals, Momma, Charlie, Tux, Cool, Benny, Jellicle, Itchy Valentino, Goldie, Nine, Amanda, Siesta, ChaCho, Charlie, Too, Mika, Crystal, Seeker, Mittens, Dancer, Smokey, Monkey, Captain Blackbeard, Season, Maven, Tink, Chunk, Curious, Hanoi, Bella, Tarry, Guido, Maxine, Mr. Kitty, Peohe, and Panda.